Attention students! the NEET PG 2017 result has been declared. The result of NEET-PG 2017 has been declared and can be seen at Notice Board at Ansari Nagar Office of National Board of Examinations, New Delhi and website www.nbe.edu.in . Qualified candidates have been assigned a unique All India NEET-PG Rank in descending order of their scores and utilizing the tie breaker criteria mentioned in para 14.4 of NEET-PG Information Bulletin. 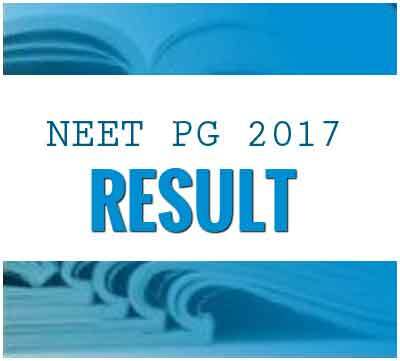 The score card of all the candidates who appeared in NEET-PG 2017 can be downloaded from NEET-PG website www.nbe.edu.in. Score card will not be sent individually to the candidates. Candidates are requested to download their score cards from website www.nbe.edu.in . Candidature is purely provisional subject to fulfillment of eligibility criteria as mentioned in NEET-PG 2017 Information Bulletin. The result for All India 50% quota MD/MS/Post Diploma Seats shall be declared by 15 th January 2017. State Quota Seats: The result of NEET-PG 2017 shall also be shared with all States/UT of India. The final merit list/category wise merit list for State quota seats shall be generated by the States/UT/Institutes as per their qualifying/eligibility criteria, applicable guidelines/Regulations & reservation policy.